In the hot Peruvian sunshine at a special forces military base on the outskirts of Lima, a small, well-dressed woman stands beaming through her tears under a flowering tree. LIMA--A group of well armed soldiers in combat clothing lean against a wall in the shade and look on impassively. After 15 months of sittings, a court had just sentenced former president Alberto Fujimori to 25 years in prison for human rights abuses including the murders of nine students and a teacher dragged from their beds by soldiers in the middle of night at a Lima university. Carolina Huaman was seeing the end of 17 years of trying to find out what happened to her sister Dora, who was one of those students. With a mixture of elation and sad remembrance for her sister, she talks with pride about what she and the other families of the victims hope they have achieved for Peru, a country with a historically weak judiciary often open to political influence. "This opens the door to a new stage in the war against impunity," she says. "Our voices have finally been heard. We have helped condemn someone who has most responsibility for the atrocities in Peru over the last decade." For Francisco Soberon, a leading human rights activist and director of the Pro Human Rights Association in Peru, the impact of the trial cannot be underestimated. He believes that it will have an educational effect and thus strengthen Peruvian democracy. "This will help Peruvians to evaluate what the regime was like under President Fujimori and his spy master, Vladimir Montesinos, in relation to corruption and human rights so that the common sense of Peruvians will start to change. And they will recover their principles," says Mr Soberon. But the outcome of the trial may also have an impact on the political landscape in Peru, especially with elections coming up in 2011. There is speculation that it might strengthen the cause of Alberto Fujimori's party, the Fujimorista, in congress as they redouble their efforts not only to get better prison conditions for their chief but also to get him released. 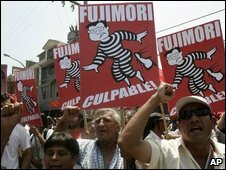 They can count on the appeal Mr Fujimori still has among many poorer Peruvians who are grateful to him for stabilising the economy, attracting foreign capital and for ending the war in the eighties and nineties against the Shining Path Maoist guerrilla movement in which 70,000 people died. (right) Mr Fujimori's daughter Keiko (left) and his son Kenyi. Keiko Fujimori is being seen as a possible presidential candidate. Outside the court house a group of his supporters, dressed in the orange colour of the party, greeted the verdict with anger. He was the best president we ever had and this verdict is totally unjust, said one woman. And the party has a trump card, Alberto Fujimori's daughter, Keiko. Educated in the United States she became her father's First Lady when her parents divorced. The 33-year-old congresswoman is expected to stand as a presidential candidate in the upcoming 2011 elections. She has said the people's fury over the verdict would propel her into power. 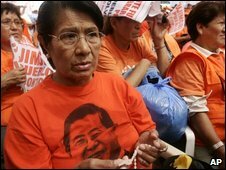 She told the BBC: "Peruvians believe he is innocent and remember that he brought peace to this country. I have always said Fujimorismo will be in first place in the presidential elections." But for the Peruvian writer and poet, Mirko Lauer, the Fujimori cause is fading fast. The Fujimorista party only have thirteen votes in congress and, he says, Keiko has limited appeal. "She is a pushover in political terms, she's not really a politician, she's not articulate and doesn't have a discourse. "In the last elections the Fujimorista vote candidate only got 6% of the vote, I don't see why this will improve with their chief in prison." Other analysts have speculated about whether President Alan Garcia might wade in to support a Fujimorista candidate and to support the campaign to release Alberto Fujimori. Mr Garcia's first administration governed during one of the darkest periods of human rights abuses in Peruvian recent history in the 1980s during the most violent part of the fight against the Shining Path. Human rights activists have said he has much to hide too and would not like a trial like the one Mr Fujimori was subjected to. Mirko Lauer argues this is unlikely. "Alan Garcia has already been investigated, he was out of power with 2% approval in the polls and guilty of governing terribly. "With enemies in government he went through the judicial system and they found very little." Mr Garcia does appears anxious to remain in power. However, the constitution does not permit him to stand for another consecutive term in office. (right) Alan Garcia in a file photo from 2006. 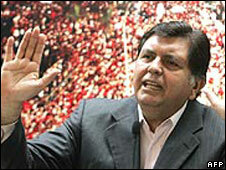 Alan Garcia's first stint as president saw rebel violence surge. Political commentators say he is fishing around to find a candidate he might support that would act as a caretaker president until he could get back into power in the 2016 elections. 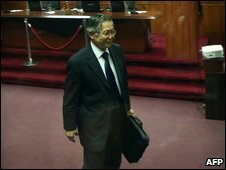 But Mirko Lauer, thinks there is little love lost between Mr Garcia and Alberto Fujimori. "Remember that President Garcia said after the trial, that a president who is elected but then stages a coup is responsible for everything that happens in the country. "And he said Mr Fujimori was welcome to look to the international courts for an appeal." Perhaps with this trial, Peru and Peruvian politicians have finally realised that the benefits of democracy and a free and fair judicial system can work in their favour.